We've never been as spooked as we were today when we were invited into the Rolls-Royce haunted mansion to see the newest from the spirit of ecstasy, the "concept" Rolls-Royce Ghost. We see dead people. 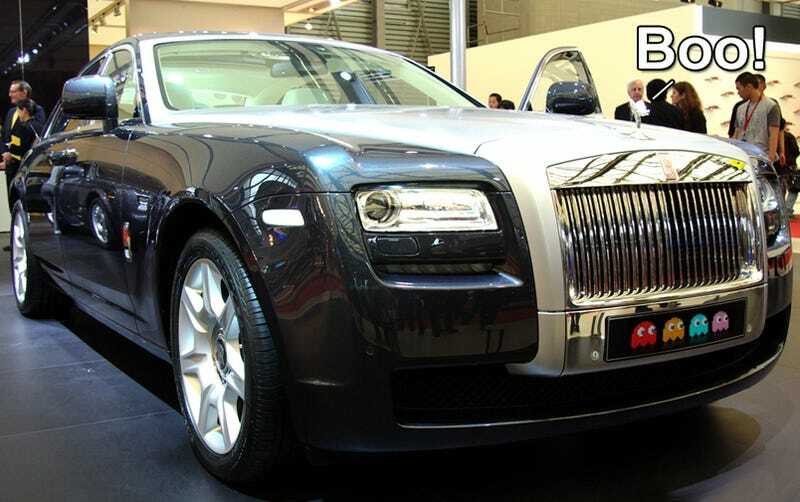 Rolls-Royce Motor Cars has announced the name for its new model series which until now has been known as RR4. The name was announced by CEO, Tom Purves at a press conference held at the Shanghai motor show. The new car will be called the Rolls-Royce Ghost and production will begin at the company's Goodwood manufacturing facility on the south coast of England later in 2009. Rolls-Royce Motor Cars CEO, Tom Purves, said, "We are delighted to formally announce the Rolls-Royce Ghost. It is one of the most revered names in the automotive industry, evoking images of adventure and technical innovation. The name reflects this new model's breadth of abilities. The first cars to bear the Ghost name were known not only for impressive dependability and refinement but also great flair and style. This car will be the first in a new generation of models to carry this evocative name and will give us two pinnacle product lines – Phantom and Ghost. The Rolls-Royce Ghost will be built on its own dedicated production line at Goodwood but will share paint, wood and leather workshops with the Phantom series of cars. Rolls-Royce has expanded all areas of its manufacturing facility over the last 18 months to prepare for the introduction of the Ghost model.